…to add the amusing picture! First half of Gildar Rift is now in the hands of the editor-beast. Onwards and upwards! 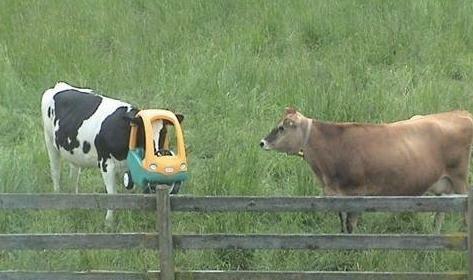 Meanwhile, here is a picture of a cow with its head stuck in a toy car. No, really. Seriously, the expression on the other one’s face. I want amusing captions from you, my beloved reader(s, just in case). Humour me, It’s my birthday in 11 days time. Mad Cow Disease, it’s just tragic. It’s so much harder on loved ones. “I think I see the problem, they put the leather seats in a bit early”. I can fly! I’m a milk float! I’m the Milk Cab Arrr Kid! “That’s the wrong colour, Daisy. Eveyrone knows that the red ones go faster”. I told you you should have got a four seater. Meet Mary she always dreamt of being a car, so to thank her for all the natural milk goodness she provides to Muller Fruit Corners and because she’s a cow and quite stupid we put a toy car over her head.